Villa in Hortas do Tabual, Nr. Vila do Bispo and Zavial. This modern, spacious villa is located in a typical Portuguese village, and is perfect for enjoying a relaxing holiday away from the bustle of busy resorts, but is within easy reach of numerous unspoilt beaches, excellent restaurants, several golf courses, horse riding, surf schools, sports centre and health spa. The villa is furnished in a modern, contemporary style with a fully equipped kitchen/diner, and attractive lounge/diner with log burning fire. It also has air conditioning and heating throughout. Several patio doors open out onto terraces with open views of the countryside. En suite shower-room to bedroom 1 with shower, sink, wc. Bathroom adjacent to bedroom 2 with bath, shower, sink, wc, bidet. En-suite bathroom to bedroom 3 with bath, shower, sink, wc, bidet. Separate shower-room with shower, sink, wc. Private parking for one car. Ample free on road parking. Spacious lounge/diner with log burning fire, and several patio doors onto a large terrace with outdoor furniture. Satellite TV, DVD player with a large selection of DVDs and CDs. Fully fitted kitchen with cooker, hob, fridge/freezer, washing machine, dishwasher, microwave, kettle, toaster, electric coffee machine, frothie drinks maker. Breakfast table and chairs. Highchair. Table and 4 chairs in the kitchen. Table and 8 chairs in the lounge/diner. Santa Antonio 5 mins. Boavista, Penina and Palmares are between 15-25 mins. Notes on accommodation: Accommodation is non smoking. For your convenience the villa has the following: Two travel cots. Buggy. Large selection of reading books, dvd's and cd's. Iron and ironing board. Hairdryer, straighteners and tongs. Selection of water floats, boards, buckets & spades etc. Outside: Private swimming pool (9 x 4m) surrounded by sunbathing terraces with outdoor furniture and a built-in barbecue for alfresco dining. Private secure parking. Cleaning / Towels / Linen / Maid service: Linen, towels and pool towels are included in the rental price, and if your stay is for two weeks they will be changed mid stay if required. For a family of 3, this villa is huge. Lovely and quiet, in a small village away from the hordes. It really is a home form home with everything that you need for a relaxing holiday. 2 lovely beaches only a few minutes away and yes an Aldi market 5 minutes away. The villa and the pool are immaculate. 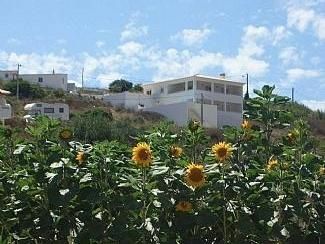 We will be going again next year so book this villa and you will not be disappointed. What a fab location, away from the hustle and bustle. There were 6 of us and we had more than enough space. The pool was a refreshing pleasure from the mid day heat and mid afternoon barbys were a must. Everything was clean and tidy and well maintained. The only thing I'd say is that you need to put the hot water switch on straight away as it took a good few hours to warm up. There is a cracking pizza place at the corner, well hidden. So take a walk and its only open on a Friday. The beautiful beaches of Zavial and Ingrina are ideal for both swimmers and surfers, have beach bar/restaurants, and are less than 5 mins by car. Nearest airport is Faro approx 1 hour by car. Car hire is recommended and we would be happy to arrange this for you. Spa and gym, tennis, archery, lawn bowls, indoor and outdoor swimming pools, restaurant and bar at Santo Antonio Golf and Leisure resort 5 mins. Sports centre with tennis, squash, gym, indoor pool at Burgau 10 mins. Several surf centres in the area. Horse riding 15 mins. Sagres with its 17th century fort and fishing harbour 15 mins. The historic town of Lagos with its waterfront marina 20 mins. Local village shop 2 mins walk. Mini market and bars/restaurants with wi-fi at Raposeira 2 mins. Bank, cash-points, pharmacy, post office, health centre, petrol station, farmers market, Lidl supermarket, shops, bars and restaurants at Vila do Bispo 5 mins. Supermarket with petrol and cash-machine at Budens 5 mins. Numerous restaurants in the surrounding villages. Large variety of cafe bars, pubs, restaurants, disco, shops, etc., at Lagos and Sagres. (All times are approx and by car unless otherwise stated). Changeover Day: Changeover day is negotiable. Arrival is after 16:00hrs and Departure before 10:00hrs (local time). Notes on prices: Prices quoted are for two persons and increase depending on the number of persons, apart from Peak times, which is a set price.